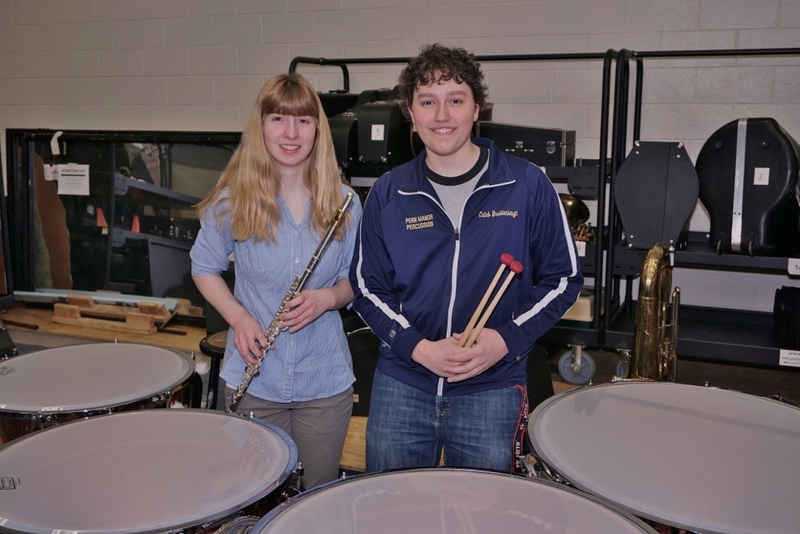 Congratulations to two Penn Manor High School students who have been selected to perform in the All-State Wind Ensemble this month in Hershey. Caleb Breidenbaugh (junior, percussion) and Emily Thyrum (junior, flute) both made their way through District and Region festivals to earn a spot on the stage Saturday, March 28, during the Pennsylvania Music Educators Conference. They qualified for the honor by auditioning in December for a spot in the District Band and Orchestra Festivals. They auditioned again at Regional Band and Orchestra to qualify for the state festival. Those with the highest scores at states qualify for national competition. Caleb and Emily also participated in the Lancaster-Lebanon Music Educators Association County Orchestra & Band festivals. In addition to festival participation, both Caleb and Emily are very involved in the PMHS music department, participating in band, orchestra, marching band, musicals and percussion ensemble (Caleb). Caleb also is a member of the Lancaster All-Star Percussion Ensemble, a group of top percussion students across the county. Emily is a member of the Millersville Flute Ensemble and this past year was selected to perform in the Cavalcade of Bands, Tournament of Roses Honors Band, which performed in the Rose Parade in January. Best wishes, Caleb and Emily. Emily Thyrum and Caleb Breidenbaugh.